The Environmental Protection Agency has encouraged members of the public to test their homes for radon. This invisible, colourless and odourless gas is linked to around 300 cases of lung cancer in Ireland every year, making it the second leading cause of lung cancer after smoking. 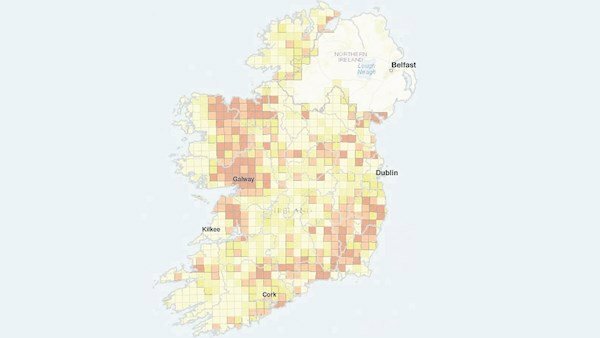 Levels of radon gas in Irish homes are twice the European average, and it is estimated that about half a million people in Ireland live in homes with high radon levels. The World Health Organisation has categorised radon as a Group 1 carcinogen, in the same group as asbestos and tobacco smoke. Only about 5% of homes in Ireland have been tested, many householders are completely unaware of the problem in their homes. The map, below, from www.radon.ie shows many of these householders are in rural areas. Radon is everywhere but, for most people, the greatest exposure to this gas occurs at home. Stephanie Long, senior scientist, Environmental Protection Agency (EPA), said: “There are simple steps householders can take to reduce their exposure and the risk to their health. “Radon is only a problem if it is ignored. How do I get a radon test for my home? Measuring for radon is inexpensive and straightforward. Radon test kits can be ordered through EPA registered measurement services which are listed on the radon.ie website. encouraging all households to take the radon test. If there is a high radon level in your house, it is unnecessarily exposing you and your family to radiation every day. It is a radioactive gas formed in the ground from the radioactive decay of uranium which is present in all rocks and soils. It can only be detected using radon detectors. Outdoors, radon quickly dilutes to harmless concentrations, but when it enters an enclosed space, such as a house or other building, it can accumulate to unacceptably high concentrations. About one third of Ireland is classified as a high radon area by the EPA, however, the EPA recommends that homeowners in all areas test their homes for radon. Two small detectors are posted to your home, one is placed in the bedroom and one in the living room, the rooms most occupied by the family, and after three months they are posted back to the measurement service to be analysed, and the results are then given to the householder together with some advice on what to do next. The whole process is done by post, and there is no need for anyone to visit your home. The cost of a radon test is between €40 and €60 depending on which radon measurement service you choose. A booklet entitled Understanding Radon Remediation – A Householder’s Guide, is available on thewww.radon.ie website. In addition, the EPA provides a list of registered radon remediation services, also listed on the www.radon.ie website. How are new homes protected from radon? Building regulations require that all new homes built since 1998 in high radon areas are installed with a radon barrier. The Construction Industry Federation offers training courses for site staff in installation of radon barriers. Having a radon barrier is not a guarantee that a home will have low levels of radon, so even homes with radon barriers installed should be tested. All new homes are also installed with a stand-by radon sump which can be activated if necessary.